Located in the heart of Yarmouth’s Historic District, the Inn is the perfect location and atmosphere for a memorable event. Our high style Victorian décor provides elegant accommodations for your special occasion. From reception, to buffet, to sit down formal dining for up to 60 persons, to dinner and dancing, the choice is yours. Our Inn features an elegant ballroom with exotic hardwood inlaid floor, brass and crystal chandeliers, working fireplaces and much more. The staff and management are sure your occasion will be a memorable one. The Inn can accommodate space for a band, DJ, keyboard, harpist or other musicians. Our staff is professionally trained to assist you in the design and enjoyment of your occasion. Uncover all that MacKinnon-Cann Inn has to offer. Our exclusive Amenities will leave you wanting more. Share some special time with your loved ones in our special dining room. The MacKinnon-Cann Inn is conveniently located two blocks east of Main Street in the heart of Yarmouth’s Heritage Conservation District. It offers the Corporate Traveler all the comforts of a fine upscale hotel. Our guest rooms, all with private 4 piece baths and some with whirlpool spas, offer a relaxing escape from the hectic business world. Business travelers will find their elegant suite equipped with WIFI secure access, separately controlled heat and HEPA air exchanger, cable T.V., private telephone service and heated bathroom floors. 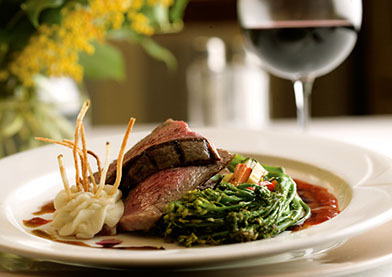 The Inn offers room service, secured parking, on-site manager, laundry services and a fine dining restaurant. Corporate rates apply seasonally and long term business guest travel packages are available upon request. The Inn is full equipped to meet the demands of our business guests and can supply private meeting space, private luncheons and group receptions for up to 60 people. Our Inn is a fully licensed facility. Reservations are required and seasonal rates apply.